In Jazz we like to say that each chord plays a particular role within a scale. The job of the I chord is pretty clear – it’s what we want to hear the most, no matter what comes before it we need this to feel satisfied at the end of a piece. The V, (or Dominant as it is often called), is expected before the I – it sets it up. The II, sets-up the V which in turn sets-up the I. You could say that the II V I does for jazz what the I IV V does for blues, and there are some short jazz pieces that consist entirely of that, (in one form or another). The II V I is used more often, however, as part of a piece of music, perhaps at the end to gently wind-down to the root chord. In any case, most of the jazz lessons I present to you will either include or entirely rely on the II V I, and there’s many interesting ways it can be adapted, so you’d best get used to it. We’re going to learn the pattern in C Major, using 7th chords. The chords are shown below, followed by the phrasing we’re going to use. Remember back when your teacher, (possibly me), told you that the deepest pitch in a chord should be its root note? Yeah, that was a lie. Sorry. It’s a good general rule though, because we like to hear root notes in the bass of a chord. Using other notes in the bass can have a dramatic effect on a chord’s overall sound, and we refer to these chords as Inversions. THIS VIDEO at around the 28min mark gives a great example of how using inversions can sound like entirely “new chords, a kind of optical illusion in sound”, (don’t watch all the video, the rest isn’t that relevant… I just like that quote). We refer to chords that use the root note in the bass as the Root Position. Chords using the 3rd in the bass are referred to as being the First Inversion. Using the 5th in the bass is known as the Second Inversion. Using the 7th in the bass is called the Third Inversion, (we won’t be using 7ths today). Be aware that the precise order of the other notes really doesn’t matter, provided the entire triad is being used in there somewhere. 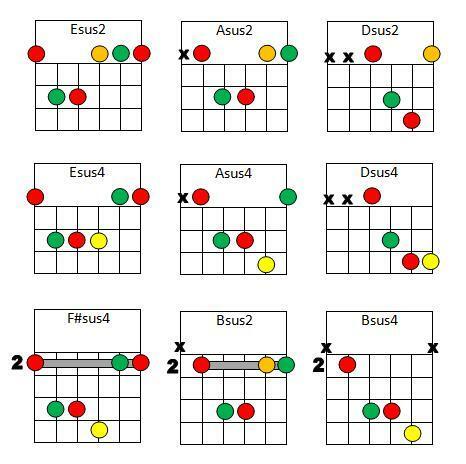 The most common, and certainly the easiest way of writing these is as Slash Chords. However, these give no obvious information as to which Chord Tone is being used, so you won’t necessarily know which Inversion it is right away, (unless you happen to know all the notes in all the chords… In which case, why are you here?) I’ll give you that information as well in this lesson. 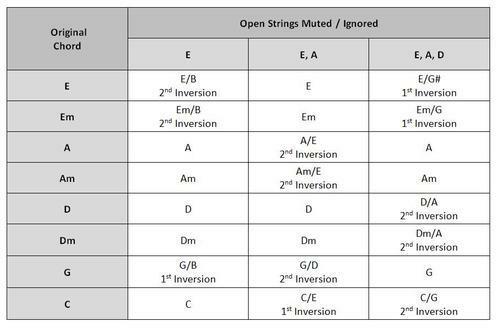 I’ll walk you through what happens to an open E chord when we remove strings, and the chart below will show what happens when we do the same to other chords. Start by playing an open E Major chord. Nice. Now, we’re going to not play that low E string. Although we’re voicing the E Major triad, it happens that the lowest pitch isn’t the root note any more. The lowest pitch is now a B which, as you should know, is the 5th in this chord. So, this chord is the 2nd Inversion of E, (which can also be called an E/B chord). Removing the A string makes this chord an E again, because the note played on the D string is the root note, E. Removing this D string will put the G# into the bass, which is the Maj 3rd in this chord. That gives us the 1st Inversion of E.
In the chart below I’ve used this same process with the other common open chords. Chords can get similarly interesting when we add open strings that weren’t previously there. For instance, if you play an open A chord, but include the low E string you get an A/E chord, (2nd Inversion). Similarly, playing a D chord and including the open A string gives you D/A, (2nd Inversion). In the next Inversions lesson we’ll talk about some practical uses for what we’ve just covered. After that we’ll move onto the 3rd inversion, which involves 7 chords. For now try to get more comfortable with the theory you’ve just been introduced to, and play around with the chords in the chart above.